Caracas -- The alarm clock rings at dawn and I am exhausted as I pry my eyes open. Then, within moments, the adrenaline starts pumping. I reach for my cell phone to check email, Twitter and WhatsApp. Any early signs where this particular day is heading? Any looting at night? Any more dead? Where are the movements on the street? 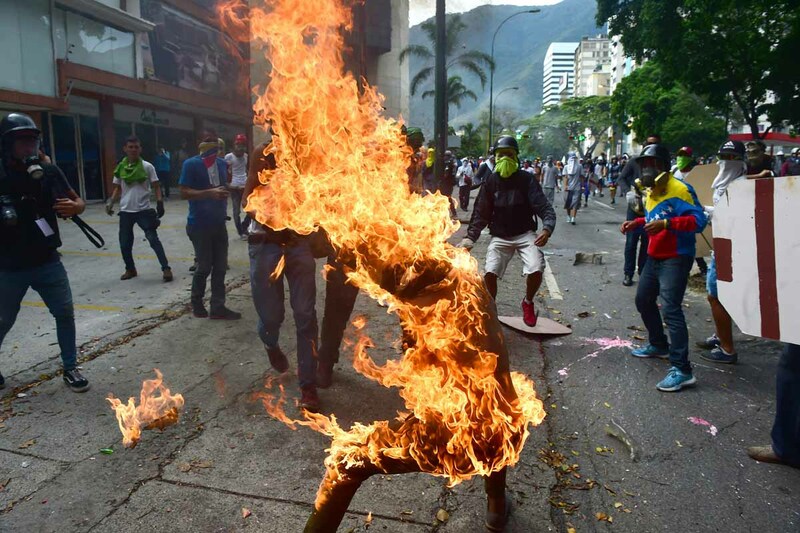 Welcome to Venezuela, a country where there is always action, but nothing ever happens, a country engulfed in opposition protests demanding the departure of President Nicolas Maduro and in violence that has claimed on average a life per day. I and the rest of the AFP team have spent more than 40 days in a constant daze of non-stop work, without having the slightest idea of how -- or when -- it may end. The events -- as well as the increasing international interest -- have kept the bureau in Caracas working at a frenetic pace. Not only do we spend just a few hours a day sleeping; we constantly find ourselves in high-risk situations as we bear witness to the clashes (sometimes pitched battles) between the protesters and the security forces. After checking my phone, a quick shower and a coffee (the first of many), I make my way to the AFP bureau. My colleagues in text, photo and video are doing the same thing all over town. The desk in Washington has updated the main text story with any developments. A flurry of calls, last-minute coordination, then on goes the bulletproof vest, and the helmet and the gas mask. Another cup of coffee, and another, and another. And off into the streets. Under the intense sun that with very few exceptions turns up the heat on the protests each day, we move from one street to another, from one neighborhood to another, on motorcycles navigated by drivers accustomed to what journalists need. It’s the only way to get around quickly and effectively. The heat is usually unbearable, we’re normally thirsty and hungry, but there is not time to stop. Nearly every day everything begins to get complicated around noon, when protesters usually head to the historical center of the capital, where security forces stand ready to once again block their way. The afternoon brings a change of climate in Caracas -- large clouds of tear gas move in over several parts of the city, unleashing showers of stones and Molotov cocktails. When we find ourselves in the middle of such pitched battles -- and in the middle is where our team has to be in order to produce the kind of spectacular images that have consistently gone to our clients over the last 40 days -- there is little time to think. You do what you’ve learned from experience, or what intuition tells you. The hard work pays off. Our team has produced spectacular images from the protests that have been published all over the world. You’ve likely seen some. A woman standing, alone, in front ofa military vehicle. A naked man walking towards security forces amid bursts of tear gas. The young man run over by a military vehicle. Being in the right place at the right time is everything. 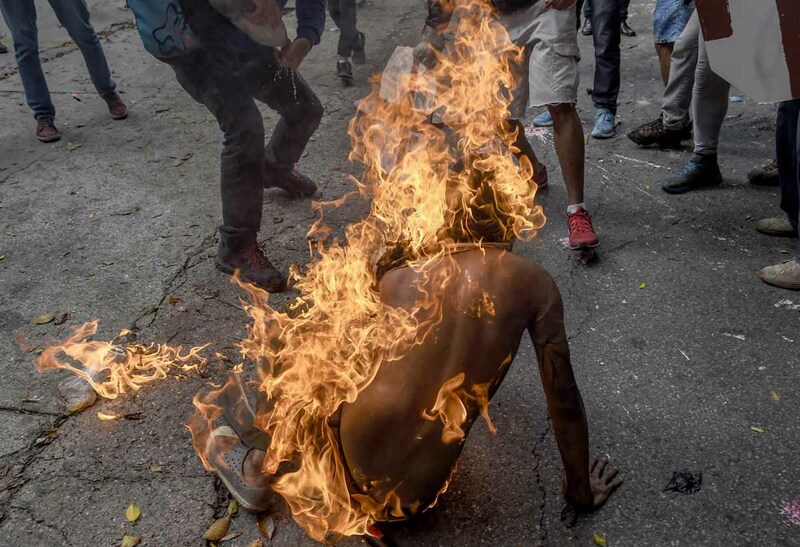 Just ask Ronaldo Schemidt, who caught the incredible sequence of the protester on fire. “I felt an intense flash of heat and turned around and saw a ball of fire coming towards me. I didn’t know what it was. I just followed it, snapping away without stopping. Then I heard the screams and realized what had happened. Ten seconds and it was over. Between the tear gas and the flying projectiles, many times we have to run. And our video journalists have to run while filming. “We are magic,” grins Leo Ramirez. “One runs and the other keeps shooting.” Together with Jesus Olarte, Leo has broadcast live for up to five hours from the protests, amid intense clashes all around them. When we return to the bureau at the end of the day, we are covered in sweat and reeking of tear gas. Ronaldo found out he has an allergy to the chemicals. Just to make the work even harder. As time goes by, the clashes become more vicious. “We have gas for the entire afternoon!” “Aim for the knees!” security forces taunt protesters over loudspeakers. Meanwhile the hooded youths facing them increase their volleys of stones and insults. It seems that they are less afraid with each passing day. As if the situation weren’t dangerous enough as it was, it’s been made more so by armed gangs roaming the streets. Protesters say they work for the authorities. The government says they are paramilitaries hired by the opposition. In any event, they roam the streets on motorcycles by day and night, when they become even more dangerous as the protests degenerate into burning barricades, shootings and looting. And just to spice things up even more, we always have to be on the lookout for thieves, on the hunt for our equipment. Text reporter Alex Vasquez one day reached into his pocket to take out his photo to record opposition leader Henrique Capriles. But the phone was gone. The fatigue and risk are not only physical when covering protests in Venezuela, where the government views the international press with deep suspicion. Maintaining balance in our coverage is one of the biggest challenges in a country as polarized as Venezuela. Both the government and the opposition try to impose their version of events in a propaganda war, fought mainly on social media. Trying to keep your cool faced with the avalanches of rumors circulating on Twitter, the preferred social media in the country, is a gigantic task. A real exercise in self-control. Want to see "fake news" on steroids? Come to Venezuela. 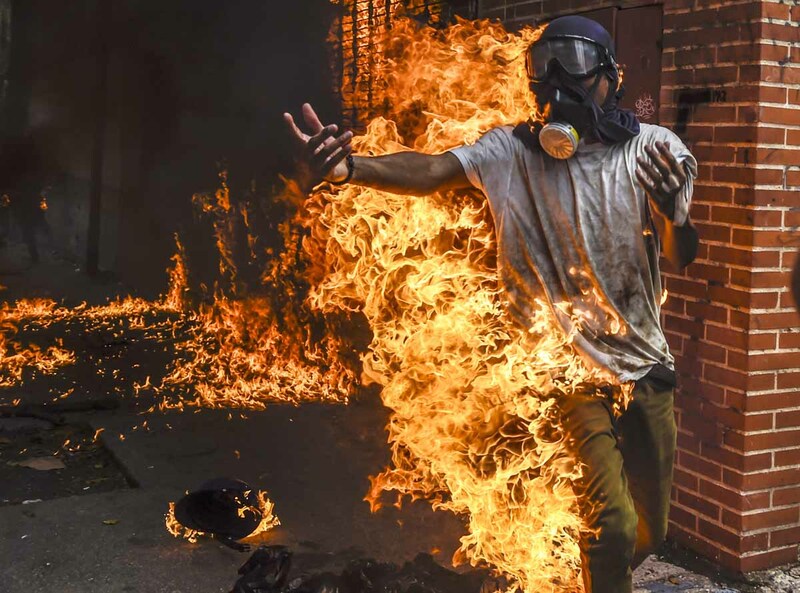 Stories like “(president) Maduro has fled into exile,” “(jailed opposition leader) Leopoldo Lopez is dead” or “Thirty groups are lying dead in the street” send your blood pressure soaring (what if it’s true? ), adding to the stress. Want to see “fake news” on steroids? Come to Venezuela. Text journalists like Alexander Martinez and I try to make our way through this fog of war to explain the crisis, to try and figure out where the country is, in simple language and in a balanced way. We do our best to interpret the events exploding all around us. But despite what some believe, we don’t have a crystal ball. And that’s how passes day after day, image after image, story after story, in a whirlwind that just doesn’t stop. As I file alert after alert, the two phones on my desk ring on a regular basis. The chat on my computer bings. One television is showing Maduro, an Internet channel is showing a session of parliament and Capriles appears on a third. There is little time for food, or family, or any kind of personal life. The abnormality of what was already an abnormal situation. Although we know it’s better to leave the bureau early for safety reasons, we go out when the night has fallen and the armed gangs are already on the prowl on their motorbikes. The city looks even more desolate at night now than under the virtual curfew that made for perfect crime conditions. In a country with severe food shortages, going to a supermarket is a tedious task that takes time. But time is in short supply nowadays. At the end of the day or two, with the faint smell of tear gas wafting through the office, a few beers feels like an awfully nice way to relax. Even if only for a little bit. Because there is no guarantee that your day will end. President Maduro has a habit of giving evening speeches without notice, just when you’re about to go home, or about to have dinner. The pings of our WhatsApp, which have rung all day, continue to do so until midnight. Days of 14 or 16 hours have become the norm. Sometimes you’ve just finished updating the text story for the umpteenth time, when it’s time to start writing about the new day that’s beginning. When we crash at night in complete exhaustion, we know that it will be an all-too-brief respite. We’ve been at this for a while now. But it’s a crisis that, for the time being, seems to have no end in sight.